Central American migrants making their way to the U.S. in a large caravan stand in line waiting for medical aid in Tapachula, Mexico, Sunday, Oct. 21, 2018. 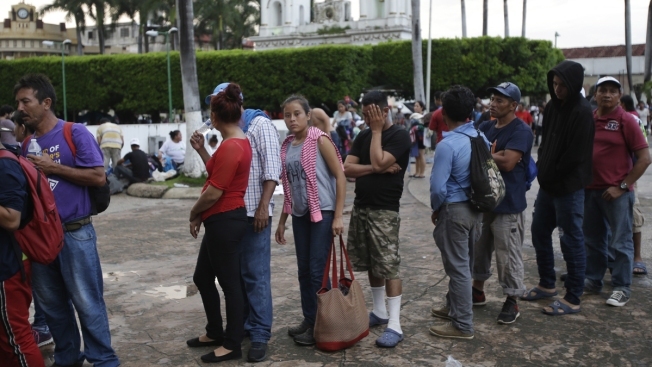 Despite Mexican efforts to stop them at the Guatemala-Mexico border, about 5,000 Central American migrants resumed their advance toward the U.S. border Sunday in southern Mexico. NBC News has debunked a handful of allegations that President Donald Trump and others have spread about the caravan of thousands of Honduran migrants that is headed north in the hopes of crossing the U.S. border. There is no evidence the caravan is being led by anyone other than Hondurans, despite Trump alleging that "a lot of money has been passing to people." Click here for more by NBC News on five myths about the caravan that are disputed by the facts.